Level: Some mathematical ability is required. 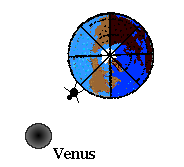 To use the transit of Venus to determinate the distance to Venus and to the Sun. These approximations are made because they are reasonable and we want to reach as large an audience as possible. A pocket calculator (may be performed without astronomical equipment). If you have an astronomical telescope, that will be fine - but neither a telescope nor other expensive equipment is needed. 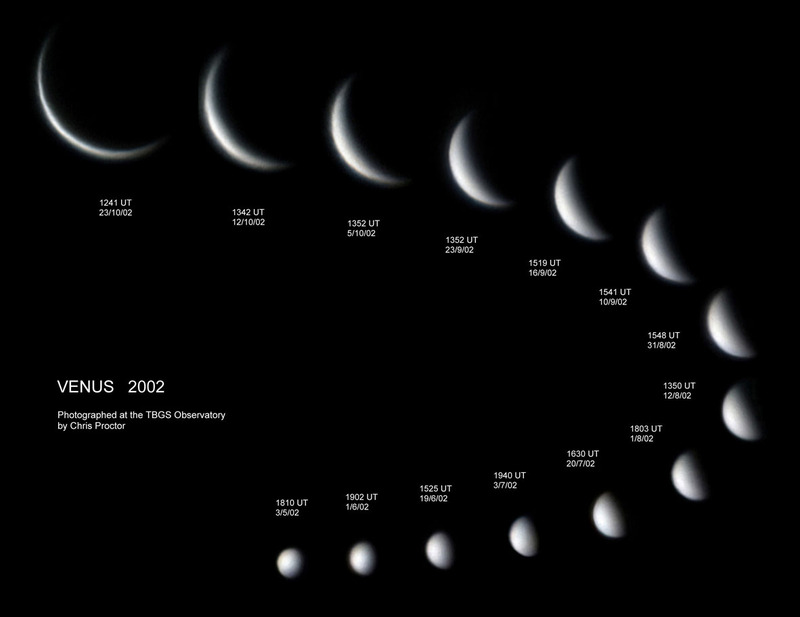 A lab experiment to understand and visualise the phases of Venus. 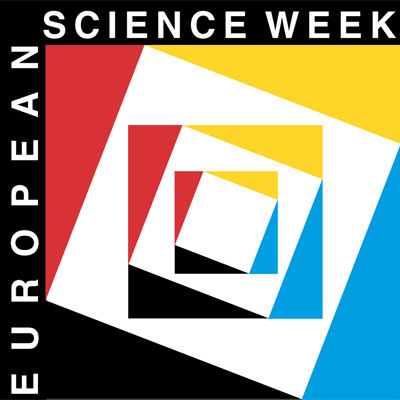 The students will repeat Galileo's first proof of 1610 that the Sun, and not the Earth, is at the centre of our planetary system. 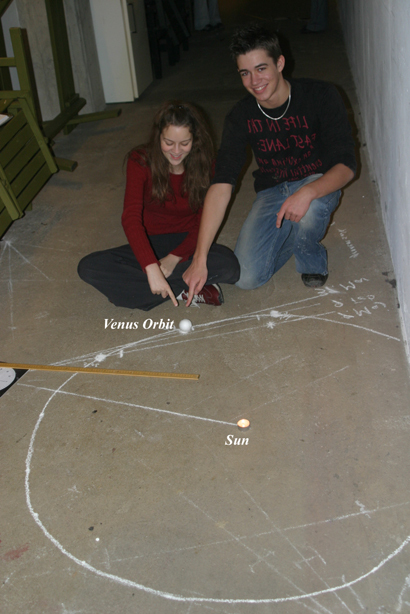 We will use the transit of Venus observations to calculate the Earth - Sun distance. The phenomena are similar to the transit of Mercury which it was possible to observe from Europe in 2003. 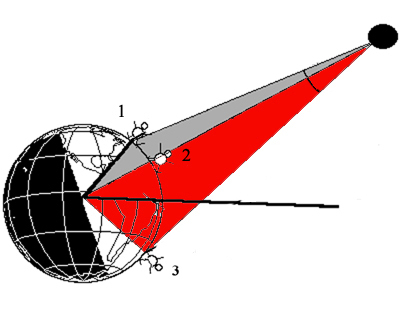 Imagine two observers, one at position 2 (the subsolar point) and the other at position 1, further to the North. 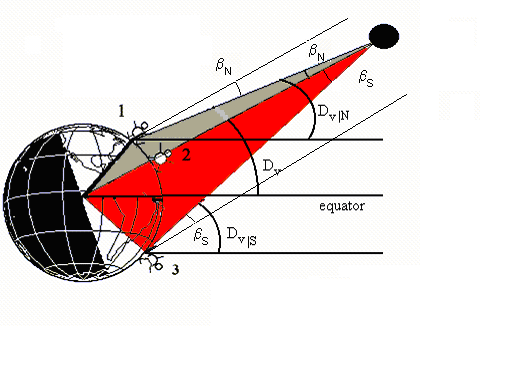 In general, observers' positions on the globe are defined by their longitudes and latitudes. You may find your own latitude from any geographical atlas, or by means of this collection of WWW interactive maps. In the following pages we consider the situation where both observers are situated at approximately the same longitude. In addition, we restrict our attention to the end of the transit, when the Sun is approximately due South, thus allowing a simple approximation. The latitude of Observer 1 relative to the equator is marked in yellow. 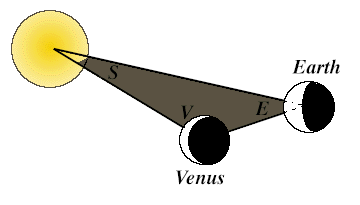 From the drawing it is obvious that Observer 1 sees Venus at a lower angle than does Observer 2. 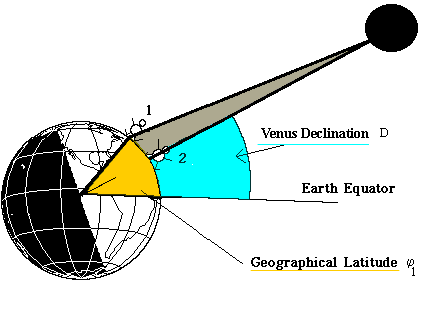 So as we move towards more northerly latitudes we see that the declination of Venus appears to decrease. You have probably been in a similar situation: as you climb a tree, you look down more and more on your neighbours. This is the parallax effect, mentioned previously. During the Venus Transit 2004 it would be nice to get data from both the northern and the southern hemisphere. If we could measure the parallax of Venus ß V relative to the distant fixed stars, this formula could be used to find the distance of Venus. However, we are unable to see the stars during the daytime, so we have to measure the parallax relative to the Sun. The solar distance is not infinite as the Sun has a parallax also. In case of bad weather - and as a preparation of what to expect - we now take a look at the real numbers involved. We have chosen two random positions, one in Europe (position 1) at Latitude North φ N = +55º and one in South Africa (position 3) at Latitude South φ S = - 30º. 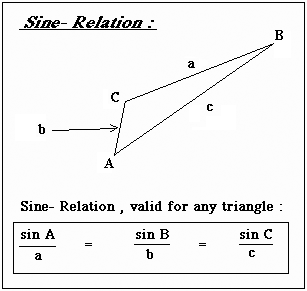 Both are in the same meridian in order to simplify the figure and the trigonometrical content of the geometrical problem. 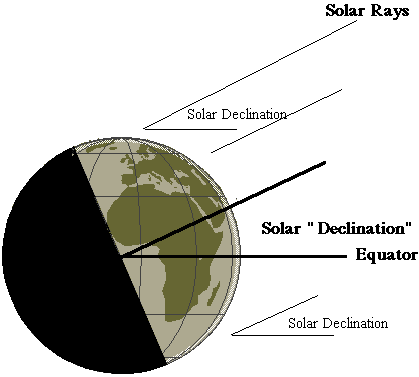 We calculated previously the Solar declination, as seen from the centre of the Earth (or position 2) as being D S = + 22º.8897. 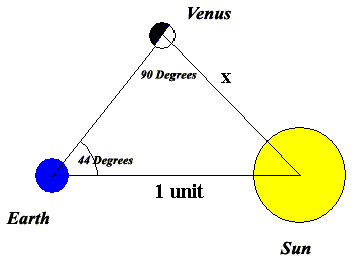 In addition, we found the declination of Venus (geocentric) was D V = 22°.6788. The radius of the Earth, R = 6378 km. Entering all the above values into the formulas, we are able to find both K Venus and K Sun. Please do this (remember, your pocket calculator should be set to "degrees") and you will get K Venus = 8482.2 km and K Sun = 8476.5 km. Now, let us take a look at the parallax to be expected. Each position was entered into the Institut de Mecanique Celeste webpage. For Venus we have three declinations: the geocentric DV, the declination for position 1 in the North hemisphere D V|N and for position 3 in the South hemisphere D V|S as shown in the figure below. In position 1, at +55° Latitude North, we get declination values corresponding to the end of the transit, nearly local noon (1100 UT). The Solar Declination D S|N is +22º53'18".3999 and Venus' Declination D V|N is +22º40'27".5448. In South Africa, at -30° Latitude South, we get the following values, also at local noon (1100 UT). The Solar Declination D S|S is +22º53'29".8560 and Venus' Declination D V|S is +22º41'07".8303.
that is, approximately half a minute of arc. For comparison, the full angular size of the Sun is approximately 30 minutes. The official value is, for comparison: 43.217 106 km. The official value is 149.6⋅10 6 km, so our simplified approach has a deviation of less than 5%. In our astronomical triangle, the length of "a" will be approximately equal to the length of "c". and during winter time shadows are long (right). So, the 'height' of the Sun (above the horizon) varies from season to season. This height is referred to as the altitude by astronomers. Note that the solar rays hit our planet at a certain angle with respect to the Equator. Astronomers call this angle the solar declination . During the transit of Venus, the Sun will be positioned north of the equator so we experience Summer in the northern hemisphere. Mathematically speaking, at this time the Sun has a positive declination . The solar declination reaches a maximum at +23.44 degrees around 22 June. During wintertime in the northern hemisphere, the Sun reaches its minimum declination, -23.44 degrees, around 22 December. Halfway between these two dates, that is, around 22 March and 22 September, the Sun's declination is nearly zero. The exact declination values of the Sun and Venus have been measured by astronomers for centuries - knowing these values has been critical for navigating the oceans by means of sextants. Precise values may be found at this Institut de Mecanique Celeste webpage. Applying the information from these webpages, we find that at the end of the Venus Transit, on 8 June at 1100 UT = 1300 Central European Summer Time, the Solar declination will be +22º 53' 22".9771 ("Geocentric" coordinates - as seen from the centre of the Earth). 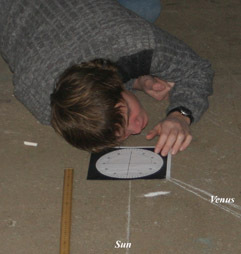 Make a schematic drawing of the Earth, including the directions to the Sun and Venus. Will you observe the transit happening at the "upper" (northern) half, or the "lower" (southern) half of the Sun? Click to see the answer (if observed from Europe)! 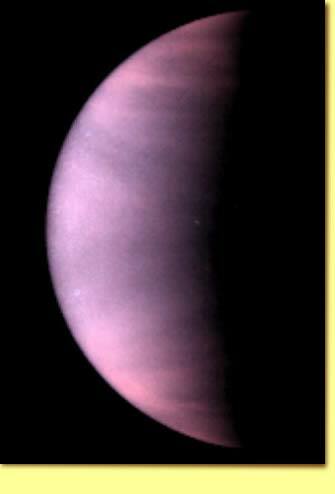 Venus will become a beautiful "evening star" during spring 2004. During autumn 2004 - the planet will be visible at the morning sky also. 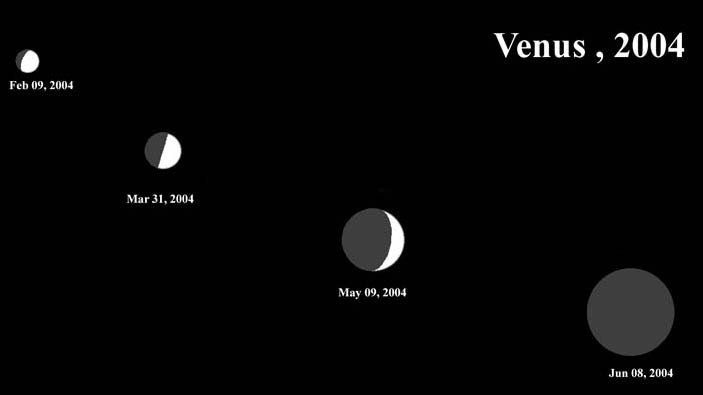 And - exactly on 8 June 2004 - Venus will perform a very rare transit across the solar disk. 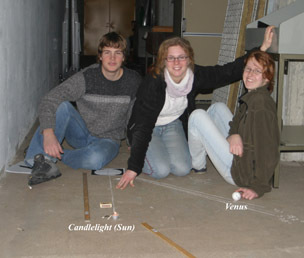 This occasion will allow our students to estimate the distance to the Sun and to Venus. However, in order to do so, we have first to investigate the orbit of our neighbouring planet. This chapter describes how this investigation can be done using simple maths and easy methods. 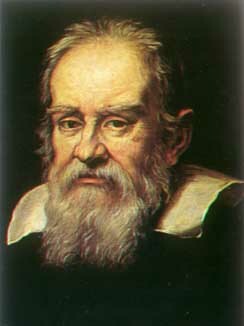 This idea originated with Galileo in 1610. 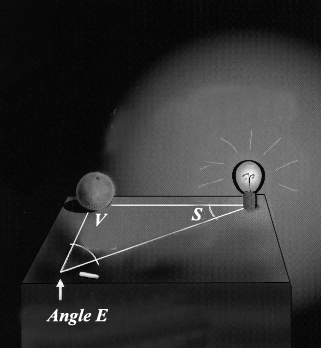 The method shown below was the first scientific proof that the Sun, and not planet Earth was at the centre of our solar system. By observing the phases of Venus, Galileo proved the heliocentricity of the solar system. If you want to repeat Galileo's observations and proof, here is how to perform the several experiments. Try this yourself: Find a good telescope - an astronomical telescope with a magnification of 25-50 times is well suited for this task. When the Earth is very close to Venus, an ordinary pair of binoculars will even be sufficient. 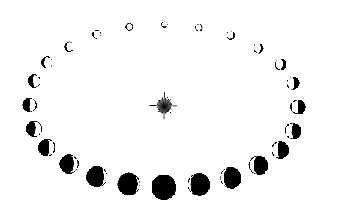 The picture below gives an indication of the phases you may observe. Click to see a most detailed image - taken at the TGS observatory. 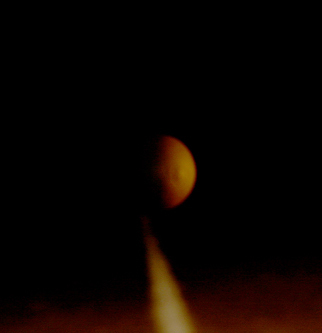 Please notice the nearly "half-moon" phase at the end of March 2004. Ask your students to bring a piece of paper and a pencil. Before the observations start, they have to draw a good circle on their paper. Now, observe the phases of Venus. One student from each group has to make a detailed drawing. Tell them they have to watch the planet for at least half a minute in order to enjoy the short moments of calm, steady air. Then, let them draw the phases in detail. Let the different groups compare their results, in order to see who is most accurate. How, by means of a lab activity, can these phases show that the solar system has the Sun at the centre? In the following, we take an example based on a computer graphic for Mar 31 2004. Now comes the trick. The Earth, the Sun and our sister planet Venus together form a gigantic triangle. 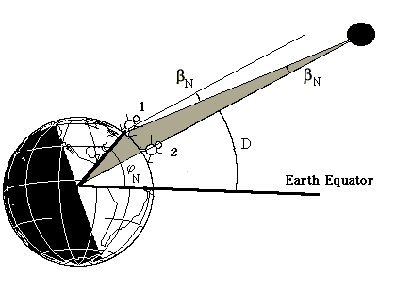 We call the corresponding angles for the Earth, the Sun and Venus: "E", "S", and "V". The angle E is very easy to estimate. The method below is not 100% accurate, but there is no need to introduce advanced maths for these simple measurements. On 31 Mar 2004, the Sun will be located due South at 12h 04m UT. As you know, the Earth rotates 360 degrees in 24 hours which corresponds to 15 degrees per hour. Therefore the time difference of 2.92 h corresponds to an angle of approximately 44 degrees. Now we are very close to the solution. You now only have to draw the angle E, in our case above: 44 degrees. Extend the left leg of this 44 degree angle, so it runs out into the laboratory for say 2 metres. Find a circular object (Galileo took an apple, but an orange is even better). Place it along the left leg. Let the light from the light source fall on the orange. Now observe how the phases vary as the distance increases. Vary the distance, until the phases correspond to our 31March 2004 image. Now you have a correct model of the solar system. 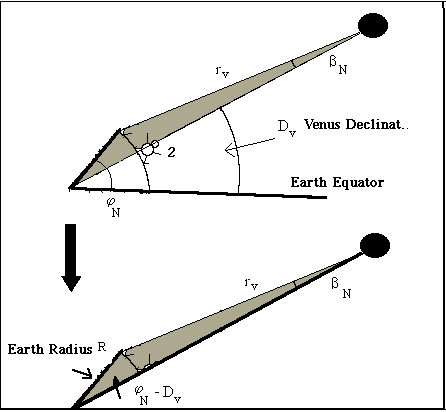 Your students may measure directly the Earth-Venus distance, and the Sun-Venus distance. This result will be applied in our calculations. Calculate the angle E for the date of your observations, or for the drawing of 9 Feb 2004 or the drawing of 9 Apr 2004. Detailed data may be found below - you should make a plot of these values against time - in order to estimate the data needed on your observation day. In the laboratory: - Once again move the orange until its shadows are comparable with the December drawing of Venus. Now measure the Sun-Venus distance, and the Earth-Venus distance. Please observe that the Earth-Venus distance has increased dramatically but the Sun-Venus distance has remained constant . As you can see, these observational arguments are simple, and they convinced Galileo that Copernicus was right. Click to compare with the official orbit values.